Heartbreak in Hiroshima. It sounds like a trashy, OTT Mills & Boon novel (I actually very much enjoy reading clichéd romantic fiction – if my love life is doomed, I don’t see why I can’t enjoy and live the love lives of fictional characters), albeit with no happy ending. This is going to be the irrational, raw, ugly feelings of the jilted. If you don’t want to know, look away now. “Promise me you’ll be careful,” my friend had said. She had been very badly hurt by a guy last year, and was urging me to be prudent, to ease myself in and sound the depths rather than just throwing all caution to the wind and leaping in as I usually do. “Yes, yes, I will. I know,” was the reply that passed my lips. Did I listen? Of course not. I threw all caution to the wind and dived in headfirst. Even better, I did that thing that the French so eloquently describe as follows – Je me suis fait un film. The over thinking, the deconstruction, the imagining. The whole shebang. 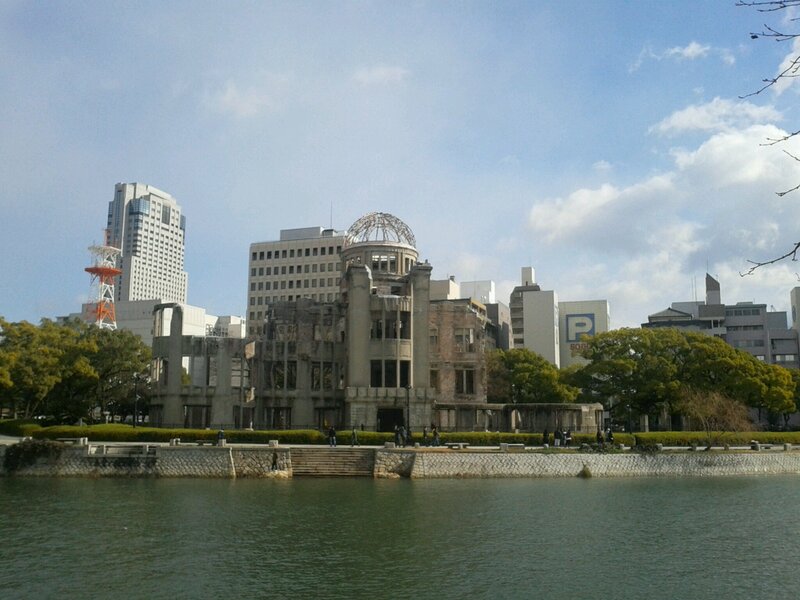 I did the stupid things people do when in love, and my desperation brought me to Hiroshima. Would she have ended up being the one sitting across the river from the pitiful, bombed out Atomic Bomb Dome? As I stare upon the derelict, haunting, ruined walls of the building that has seen better days and, in its devastated state, it seems to me there is no better object to signify the current state of my heart than that. The sky is grey, and the raindrops patter down around me as I take shelter under my umbrella. All I need to do is shed a few tears and the picture will be complete. “Promise me you’ll be careful”? It’s too late for me. It has ended painfully. She would make it though the heartbreak. It would take time, but she would. Yes, I’m sad. Yes, it hurts. Yes, all I want to do is hide under my duvet, hibernate, and not emerge until the pain is gone. I have a life, responsibilities, and a job. I have no choice but to be brave and strong, at least at work, and save the tears for my pillow. The A-Bomb Dome in happier days.